Rethinking Organizational Change: The Role of Dialogue, Dialectic & Polyphony in the Organization makes an important scholarly contribution to our understanding of dialogue applied to the management of change. Muayyad Jabri offers an involved assessment of the differences between 'dialogue’ and ‘dialectic’ and an intriguing invitation to rely on both for managing creative interventions into the change process. The book provides a surplus of new insights that will help to promote scholarly work in the area of managing change and to develop a more creative practice associated with the processes of managing change. The call for polyphony facilitates a crossover from sameness to diversity and from univocal to multivocal representations. In reading patterns of managing change, whether from within or across organizational borders, it is found that a vital part of the reading is, at present, ‘unreadable’ because we lack involved knowledge of how diversity and polyphony are interrelated. 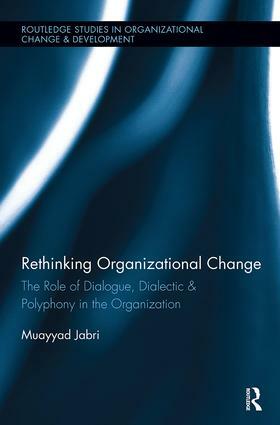 This book seeks to change this; based on a rendition of Mikhail Bakhtin’s anthropological concept of polyphony applied to organizational change. The reader is treated to a cutting-edge discussion of a variety of contemporary ontological and epistemological themes centered on process, dialectic, dialogue and social construction. Muayyad Jabri is an Associate Professor at the Graduate School of Business University of New England Business School, Australia.